Oh Hey! I hope everyone had a wonderful weekend! It was nice to finally have a break yesterday to catch up on house stuff like laundry and thank you notes. Saturday night I went to a vegetarian/vegan restaurant with my friend Chloe, it was so delicious! I ordered the General Tso's Cauliflower, which is cauliflower instead of chicken, you couldn't even tell the difference and it was amazing! I am going back there again for sure! I ordered this pair of shoes for the holiday's and just winter months, I cannot wait to get them! They are a new arrival but are going so quickly, my size has sold out 3 days in a row and when I finally saw they were in stock yesterday I had to go for it! I love the print and of course the scallop detailing! Other options I considered were this pair (selling out quickly as well!) and this pair. I am trying to stop myself from getting these too! The jacket I am wearing above is fully stocked and now in 6 new colors! 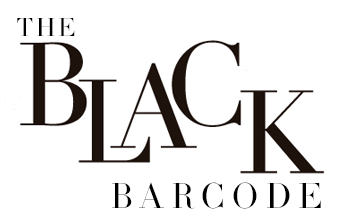 It feels like it is a $1,000 jacket, such great quality and a piece I will have in my closet for year. If you are thinking about getting one, jump on it! You won't regret it! Ah I am obsessed with this moto jacket! I've been seeing it in so many colors and I want every one! I've been crushing on burgundy this season. LOVE this jacket! Stunning! I love the color combo, it's so perfect and I love that you layered burgundy on burgundy. Plus that jacket is my fave! 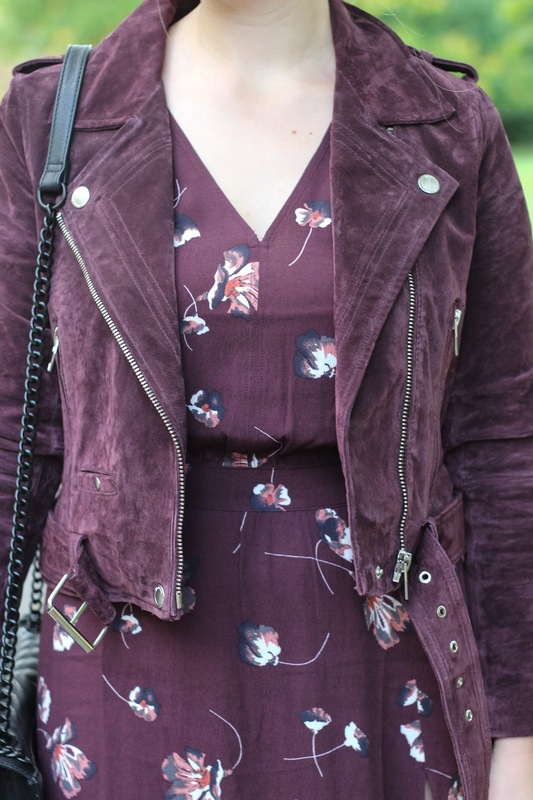 I love the dark floral dress and the moto jacket as well - what a great color! 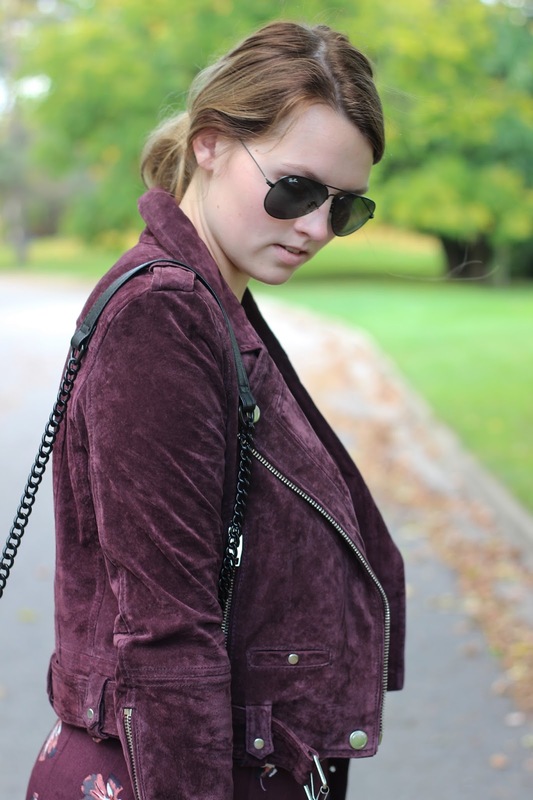 ahhhh...my VERY favorite suede jacket this season!! LOVE it with that dark floral!! Such a gorgeous burgundy dress! You look gorgeous! 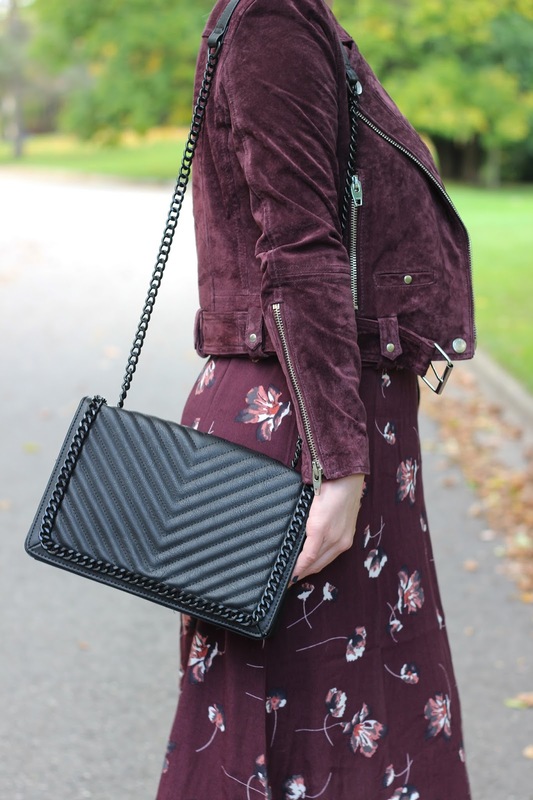 You look amazing and love the burgundy on burgundy fall look! I recently tried roasted cauliflower for taco filling and was blown away at how delicious it was too! This dress! That color! I want that bag! I would wear burgundy every day if I had enough of it! so pretty on you!